Rigid splints with flexible internal structure can be used for adults and children of any size. The versatility and the compactness that characterize the splints make them useful for the rescuer even in the most strange of situations. The arm and forearm splints are also used as an armrest during intravenous infusions. 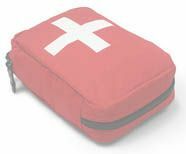 Perfect for ambulances, medical cars, mountain rescue, sport medicine, water rescue, orthopedic centers, first aid and any kinds of emergency departments. The lightweight of the complete kit and the reduced dimensions makes it the least cumbersome and compact system on the market. Made of Velcro®, they allow a fast and easy fixation. The top part of each splint is highlighted by an orange colored Velcro®. The top strap is highlighted with by blue webbing. The outside part is blue, the inside is black. It is made of a tempered ergonomic profile. The profile, purposely studied, offers total rigidity. The thermal treatment allows bending and return to the original profile under normal conditions without considerable structural alterations. It can be done directly with alcohol or mild disinfectants. On removing the inside structure, Blue Splint can be machine-washed at a maximum of 40 °C [+104 °F]. Osama-Tex has specifically studied and produced Nyoprene for the realization of Blue Splints. Nyoprene has structural characteristics and incomparable therapeutic and dynamic properties, determined by the sandwich composition: a central core of neoprene, covered by non-absorbent 100% laminated nylon on the outside and inside part. More info about Rigid splints Spencer Blue Splint Kit ?